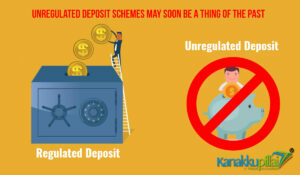 1) What are Unregulated Deposit Schemes? Regulated Deposit Scheme, as specified under Column (3) of the First Schedule. 2) What is the Scope of this Ordinance? even Regulated Deposit Schemes mentioned in Column – 3 of Schedule – I to the Ordinance. invest in or become a member or participant of any Unregulated Deposit Scheme. earned savings of the innumerable uneducated investors in our country. how people fall prey to such schemes come to the foreground. First Schedule to the Ordinance. relatives to tide over a crisis. or for the purpose of, business, the government has clarified. 5) What are the penalties for defaulters? pecuniary fines ranging from Rs 2 lakh to Rs 50 crore to act as deterrent. such schemes nonetheless manage to raise deposits illegally. property and restitution to depositors. 6) What is the way forward? Authority, who should not be below the rank of Secretary to the Government. and they will collectively discharge the functions of this ordinance. every Deposit Taker, existing or new, to intimate such authority in a prescribed manner. legitimate deposit takers and schemes operating in India. Previous New India redefines its Angel Tax Theory on Start-ups! Next E-Form Active – Get your Company “Active Compliant” Now!